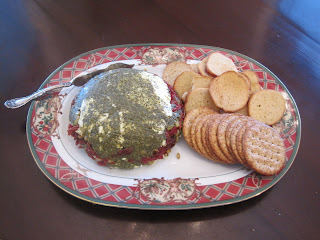 This is a yummy goat cheese torta is a perfect party dish. 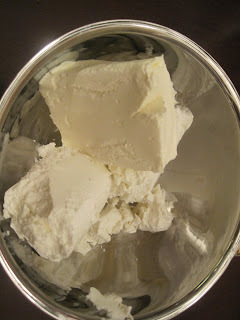 You'll need two packages of goat cheese (four ounces each) and cream cheese (the small three ounce size), soften it makes it easier to mix them together. 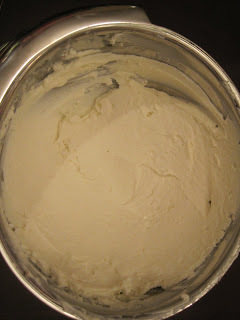 Now, I only add the cream cheese when I know my children are going to be eatting it (the goat cheese can be a little over whelming for them). I like it both ways, but prefer it without the cream cheese. Next, you need a jar of pesto, a jar of Alessi imported sundried tomatoes in extra virgin olive oil (7 ounce size), you can use any sundried tomatoes, but I have found these are the yummiest in this dish. 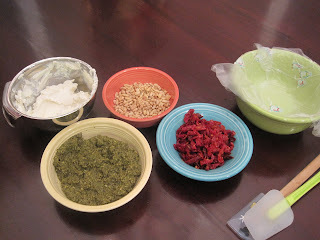 A couple more items are needed, pine nuts, a bowl, cling wrap and a strainer. 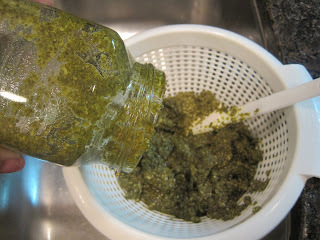 Pour the jar of pesto into the strainer, this helps get out all the oil. If you don't do this part your torta will be very oily and look yucky. 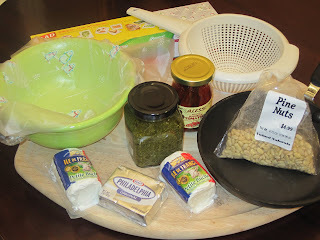 So, while your pesto is straining, move on to the cheeses (soften), add all the cheese together and mix. 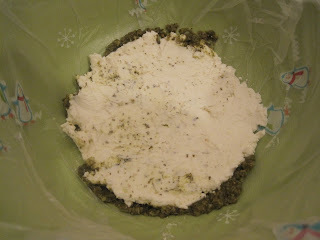 Goat cheese and cream cheese all mixed up. Don't let this part stop you from making this, it's easy and takes a couple of minutes. 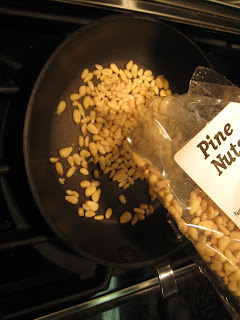 Roast the pinenuts in a small skillet over medium heat, keep the pinenuts moving around the pan and cook unitl slightly tan. 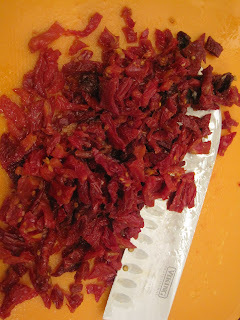 Chop up the sundried tomatoes, and remove any excess olive oil. 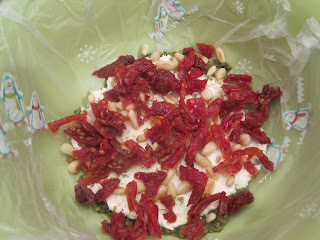 Now all of your ingredients are ready: the goat cheese and cream cheese are mixed, the sundried tomatoes are chopped, the pesto is drained and the pinenuts are toasted. Line a bowl with cling wrap with enough going over the edge of the bowl so you can use the excess to cover the torta when it's done. First in the bowl, the pesto. 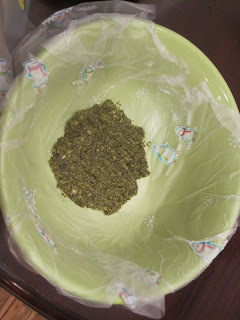 Add a thin layer to the bottom of the bowl (on top of the cling wrap). 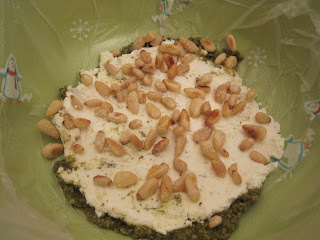 Then the cheese mixture on top of the pesto. Add the pinenuts on top of the cheese. As many or as little as you like. Sundried tomates are next. Again as many or as little as you like. Then start the process all over again until you are out of ingredient. I like to finish with the cheese. 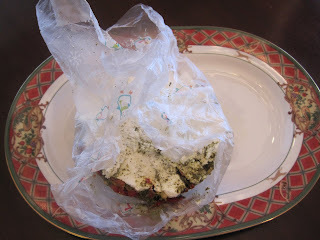 Cover with cling wrap, refrigerate for a couple of hours. After the torta has chilled in the refrigerator for a couple of hours, you can take out the torta from the bowl and get ready to flip onto a plate and remove cling wrap, add crackers and serve.